Chances are very good that during the coming seminar and sport show season my response to a simple question is going to disappoint the person asking it. I’ll be asked the same question at least once a week and I’ll give the same answer. It will be an honest answer, but it won’t be what they were looking for. I always see a look of surprise when I give that answer. Maybe thequestioner is looking to be reassured about a hot new lure they’re considering buying, or maybe they think my answer is too simple ‘ that my fave should be something that involves more effort and concentration to fish properly. Don’t get me wrong ‘ topwaters provide dramatic visuals of big predators on the feed, the memories of which give me goosebumps; fishing crankbaits along a weed edge puts me into a zone I can’t describe; and the mental image of a musky rolling up from below ‘ seemingly out of nowhere ‘ to T-bone a jerkbait is something I see in my dreams. I love using other types of lures when the conditions dictate. The reasoning behind my ranking a bucktail No. 1 is sound. If muskies are chasing and eating bucktails, they’re aggressive and my chances of catching more than one fish that day are very good. I see musky fishing as a game of percentages, in that if you play the percentages you’ll contact more active fish and thus catch more. And bucktails are a high percentage bait. 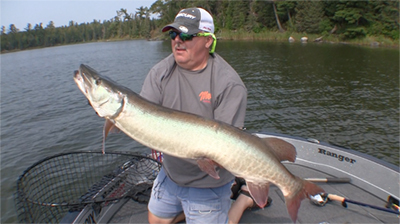 Catching muskies consistently, from day to day, month to month, and season to season, is no easy task. Nature dictates that all top-of-the-foodchain predators, regardless of species or environment, be few in number. Consistency of capture is never easy. 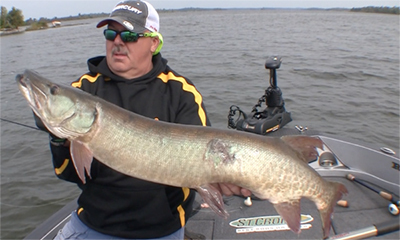 Ifollow four rules to achieve some degree of consistency in musky fishing. Now, I don’t catch muskies every time out, but I catch them often enough to expect to catch a musky every day. In fact, I’m surprised when ‘ between my boat partner(s) and I ‘ we haven’t caught at least one musky by day’s end. During a two-week stint on Lake of the Woods last July, I achieved something I didn’t think possible ‘ every day, for 14 days straight, at least one musky was caught by me or someone in my boat despite at least four cold fronts and a couple of days with wind exceeding 30 mph. A total of 26 muskies visited my boat during that two-week trip but one thing that didn’t catch up with my boat was the proverbial skunk. I cringe when I hear someone say they always start fishing the day with their favorite bait, regardless of conditions. It’s great to have confidence in a lure, but if it doesn’t allow you to fish as fast as conditions dictate your day’s gameplan may actually cost you muskies. Last summer, for example, I spoke with a fisherman who told me the first lure out of his box every day was a Suick Musky Thriller. The Suick is deadly in the right application and I’ve caught as many as seven in one day on that bait, but it calls for a relatively slow presentation. It may be the best bait in some conditions, but in others it will hardly be the most efficient. As I outlined in my article, ‘From Fast To Finesse,’ ( Musky Hunter , February/March 2004), I follow a lure progression that starts as fast as conditions warrant and moves down the line to finesse presentations if fish don’t respond. Under warm water/pre-frontal conditions, a bucktail will almost always be the first bait out of my tackle box for the day. Under cold water or post-frontal conditions, a flat-sided minnowbait (Slammer, Crane, Grandma, Jake, etc.) is first because I can still fish it relatively fast, but it has properties that trigger neutral or non-aggressive muskies. Dive-and-rise jerkbaits like the Suick are in both my warm water/pre-frontal and cold water/post-frontal progressions, but farther down the line. I consider bucktails and minnowbaits high percentage lures for another reason ‘ they hook fish. A bucktail collapses down to little more than wire and hooks when a fish strikes, and with minnowbaits it’s often not a matter of hooking the musky but how many hooks will be in it. A bait may become a high percentage offering simply due to the conditions. In areas with heavy weed growth, a bucktail with treble hooks may yield nothing but hangups. By switching to a spinnerbait with upward-riding single hooks, you can often fish these areas with much less fouling, thus making the spinnerbait the higher percentage lure. When fish are holding in pockets in a weedbed, the vertical presentation of a weighted dive-and-rise jerkbait like a Suick may be the best way to root ’em out. You can also fish percentages by targeting areas that have wind or current pushing onto them, because the most active muskies often position themselves with their nose into the wind or current; and by being on good spots during key times, such as morning or evening, moonrise/set, sunrise/set, or during a condition change (sky or wind). Many of the muskies caught during my two-week streak on Lake of the Woods were taken in the evening ‘ not only is this a great time because of sunset, but full moons rise in the evening and the combination of moonrise and sunset within a couple of hours of each other (and sometimes a couple of minutes) yielded two strike-triggering factors in a short period of time. 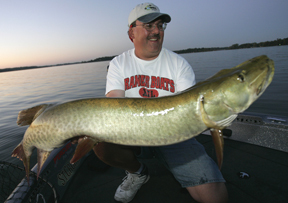 Not surprisingly, most of the evening muskies were caught on bucktails in wind-blown or current areas. While fishing percentages is a great idea, be sure to check areas and times that don’t fit the norm. If they don’t seem to be in wind-blown areas, be sure to check spots that are out of the wind. This can be an enormous factor in post-frontal conditions. If the wind switches 180 degrees from one day to the next, and was blowing hard before it switched, this pattern (some call it fishing ‘yesterday’s wind) is even stronger. 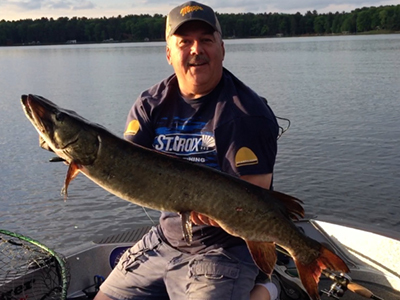 A few years ago, checking ‘yesterday’s wind’ resulted in my catching a 47-inch musky and a 41-inch northern pike in short time after that day’s wind produced nothing but frustration. The wind had been blowing hard for two days from the northwest, then switched to the south but both big, active predators were positioned on northwest-facing rock points. Last fall I enjoyed a tremendous 3 1/2-day trip to a Minnesota lake I’d never previously fished. My partner and I arrived on a Sunday when the wind blew steady from the south, and the first evening we boated a 42-incher from a slight inside turn in the weeds that had a steady breeze blowing on it all day. However, the next day was clear and the wind blew hard from the northwest, and we initially found a few active muskies utilizing the wind, catching one and losing one. That evening those fish seemingly disappeared, so we decided to check the spots where the fish had been the night before but were now out of the wind. Casting an ERC Grinder spinnerbait to combat the ever-present milfoil, I caught 45 1/2- and 38-inch muskies on back-to-back casts and then lost a 39-incher at the net three casts after releasing the 38. The point is, keep an open mind to musky location. If they’re not doing what they’re supposed to be doing, or aren’t active on the spots you think they should, be willing to do the opposite. Muskies sometimes break the ‘rules.’ Keep ’em honest. I don’t fish a lot of tournaments, but one thing I’ve learned from fishing one or two every year is that no matter how tough I think the conditions are, somebody is going to figure out the pattern that day and catch fish. To be consistently successful, especially in a tournament situation, you need to be that person. While on the water, work with your boat partner to consider every available factor. Are the most active fish in weeds, rocks, hard bottom outside the weeds, inside the shallow weed edge, in pockets, turns or points in the weeds, in the rushes, in the rushes near rocks, in the gap between the weeds and rocks, or suspended off the breakline? Are they utilizing shade from trees or docks? How deep are the fish holding ‘ are they engaging the lure in a shallow zone or are they rising up suddenly at boatside? How close is deep water to the spots that seem to be holding fish? How is wind or current playing into this? Are following fish moving quickly or are they merely along for the ride? Is there a time of day when fish are utilizing any of the above-mentioned areas, or when they seem to be more active? Muskies can be individualistic enough that one fish’s behavior or location may not be a pattern, but it’s worth trying to duplicate what you saw from a single fish. If a second fish shows and its location and activity level matches that of the first fish, you’ve got a pattern that’s worth investigating further. For example, if you have a follow from an active musky that was holding tight to weeds on a point that has wind blowing directly onto it (a classic scenario), check your map for another weed-covered point with wind on it and chances are good that it too will have an active fish. If it does, you have unlocked the pattern. If this pattern fizzles after a short time, the muskies likely didn’t move far. Check the water outside the weed edge, check the thickest weeds on the point, and check any inside turns located nearby. If you find a musky that has moved, go to similar locations and chances are good those fish moved, too. During the Minnesota trip mentioned earlier, every active musky was related to either an inside turn in the milfoil or about halfway between the inside turn and a milfoil-covered point. Wind direction was a wild card ‘ sometimes it helped, sometimes it didn’t. But we found we didn’t have to check large weed flats or shoreline stretches because the active fish were in or near the inside turns. By pinpointing these areas and ignoring the larger locations we spent more time contacting active fish. While you’re being observant of your own successes and failures, pay attention to other boats. Check your map to note what structure or cover others are fishing, and if they later move to a spot similar to the one they were fishing they may have unknowingly tipped you off to a pattern they’ve found. By all means do not move in on them, but check your map again for other locations that are similar. Likewise, a group of panfish or walleye anglers may tip you off to a location of baitfish in an area you may not have otherwise fished. When they move on, be quick to investigate the area they were fishing because a school of baitfish usually has muskies nearby. If you find a concentration of muskies in an area be sure to note what individual fish are relating to and the times you are seeing these fish. If there are lots of fish using a spot this can be an information overload, but a pack usually is in one location for a reason and that’s to feed. If the muskies are merely following, keep coming back until you discover the time(s) when they are feeding. Then, of course, be on the pack during those times every day until they move as well as during prime condition times (sunrise/set, moonrise/set, etc.) to catch as many as possible. Finding a pack is an incredible thing and something that you can use to convert a good trip into a great one. During my two-week trip to LOTW last July, six of the 26 muskies in my boat came from one island complex and, rest assured, we didn’t get them all. Late in the week during a 2004 trip to Lake of the Woods, I found a reef with a small patch of cabbage and rushes that contained at least a dozen different muskies ‘ I got three of them before I had to go home and left a lot of unfinished business. 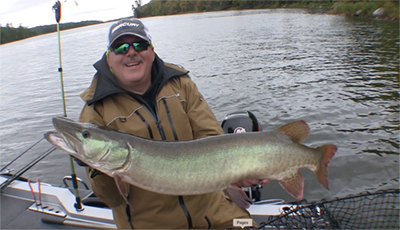 Catching muskies with consistency is never easy but it can be done by fishing in an efficient, observant, open-minded manner. And you have to, since we’re dealing with a critter that can seemingly change its attitude in a split second. Keep these four steps in mind during the coming season and you may find musky catches a more consistent happening in your boat.